Narendra Modi has been good for India. Modi has been tough on internal and external security threats. Modi is better for India than the alternatives. Modi is using technology for the benefit of the nation. Under Modi's leadership, the Indian economy has flourished. 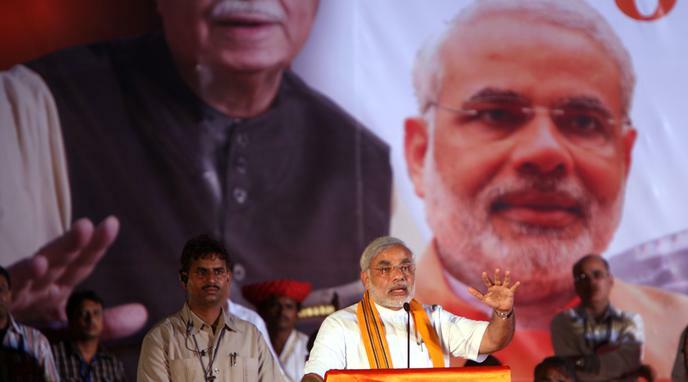 Modi has been combatting corruption and government inefficiency in India. Modi has been strengthening India as a global and regional player. Modi has improved Indian's quality of life. Most Indians still support Modi. Modi has failed to deliver on his election promises and has thus let down the people who voted for him. Modi is turning India into an Oligarchy. Business men close to the BJP, and Modi in particular, have prospered disproportionately from government policies and the Modi government's rule in general. By spreading false information on social media and offline platforms, the Modi government is purposefully keeping the Indian public ill-informed. The Modi government has failed the Indian education system. Modi has been systematically removing democratic checks and balances that impact his hold on power. The Modi government is turning India into a surveillance state. Modi has no original ideas on any aspect of governance. All his projects since his days of Chief Ministerships have been window-dressed versions of someone else's concepts. Modi is dividing rather than uniting India. Modi's government is harming the environment. Should Aadhaar (Unique Identity Number) be made mandatory for all citizen of India? Was the 2016 banknote demonetization in India a good decision?